I bumped into David every now and then in my early wanderings through wild places. But I really got to know David only when I started guiding at Sungei Buloh. David was always there, patiently documenting nature and gently and generously sharing his passion for the wildlife around us. David is a great nature photographer, but also a fabulous teacher. Not only of photography, but of nature appreciation and life in general. 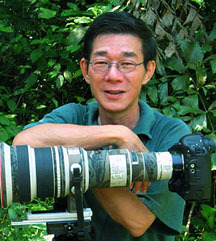 He gives generously of his magical photos, to nature awareness efforts by volunteers and organisations. He also gives workshops and guidance to school children and other budding photographers, showing the true way to photograph and appreciate nature. I was overjoyed to hear that David has launched a website of his work so that everyone can enjoy and learn from his work. How did you first get involved in working for nature in Singapore? I have always been interested in nature and wildlife since I was young. Whenever I see an unfamiliar creature, I would stop in my tracks to take a closer look at it. Being interested, I naturally read up a lot on wildlife, especially on birds. As Singapore progressed and grew over the years, Singaporeans began to lose touch with nature. Wanting to impart my knowledge to the people, I decided to sign up as a volunteer. What do you get out of working for nature? I contribute mostly by photographing wildlife and plants for the National Parks Board. As photography is my primary hobby, I enjoy the challenge of photographing them. When my works are appreciated and people go, "Wow, I didn't know that animal existed in Singapore", I know I have achieved my aim. What is your approach/personal motto in your work? Part of my motivation in nature photography is the enjoyment of rare visual beauty in the wild. I have just set up my personal website. Hopefully, this would allow more people to get in touch with nature since most people have a computer and an internet connection at home or at their workplace. WOW!!! What more can I say about David's work? World Class! Ria, Can you make an introduction? Posted by Ria Posted on 21/07/04 14:40 Of course. David will be more than delighted. And he is the loveliest person to work with. What is your email address? So I can send a simultaneous email to both of you? You can email me at hello@wildsingapore.com Thanks! I saw David's photos long before I met him - the power of photography and the internet. Also another gem to meet at Sg Buloh. So glad to hear about his webpage!